A Picture of my Heart. I've been up since 2:49am when the hospital called with an update on Steve. Let me first say that he's doing OK now. My 2nd dose of sleeping meds didn't kick in and I need to do something quiet while Paisley sleeps...so I'm sharing the pain and asking you to send healing thoughts his way. Yesterday morning, Steve was medivacced to Robert Wood Johnson Hospital in New Brunswick. We still don't know what happened. All the tests came back negative except for his 2nd set of cardio enzyme labs which came back elevated. Having said that, they're still not sure it was a heart attack. They'll do a 3rd set of cardio enzyme labs 8 hours after the 2nd set. The doctor said the elevation was consistent w/ a fall and MAYBE a heart attack so they've put him on aspirin. After the extensive testing done yesterday, that's all they've come up with. What happened as far as can be pieced together? Steve was out front trimming some roof shingles. Obviously, he was on a ladder. Paisley and I waved to him from the bathroom. He was fine. I took a shower and got dressed b/c we were going to a friend's for a playdate/picnic and were supposed to leave around 10:45am. (I'm pretty sure I remember Steve calling up to ask when we were leaving; I think it may have been 10:15-10:20am.) I went downstairs and was walking into the dining room when I heard Paisley say, "Daddy, Daddy, wake up." I looked out the sliders onto the deck and Steve was sitting on a bench w/ his back against the railing, snoring heavily. I thought he was playing a game w/ Paisley like, "See if you can wake the Sleeping Daddy." It was very exaggerated snoring. So I went back inside to get a stuffed animal to bring with (I think; I'm a little fuzzy) and then went back to the sliders. Steve was still "playing." But he was sitting at an odd angle. I felt a little alarmed and then saw he had drool running down his arm. I did the normal thing...freaked out. I ran inside and called 911 immediately b/c he was unresponsive. Within minutes, literally, the paramedics and police were there. After that, I'm not really sure what happened - the police were asking me questions as to what happened. When I was on the phone with dispatch, I saw that the ladder was now in back against a tree which needed some branches cut. I pointed that out to the police and the paramedics and police assumed he'd fallen. And that was good. Because of that assumption - that he could have sustained serious trauma to the brain and/or spine, he got helicoptered to RWJ and was seen immediately by excellent doctors. Again, extensive, but inconclusive, tests were run. They moved him to ICU in the afternoon., took him off heavy sedation and extubated him. He had actually been responsive while sedated and could squeeze our hands, blink an eye and drop his arms when he started struggling. He's pretty fuzzy on the details but, as best he remembers, he believes something bit him; he felt pain and heat; he remembers it being the right shoulder but there were not marks; that's really about it. However, his symptoms don't present like anaphylactic shock from a bee sting or spider bite. Fortunately, I called Steve's parents who mobilized the NJ troops and his Cousin Leslie, Uncle Ira and Aunt Kaye spent much of the day with me. His parents are flying in from AZ as I type. We have friends who took Paisley yesterday and will again today. She had a great time with them all day but when we got in the car, after I'd picked her up, she asked, "Mommy, where is Daddy? Why was he sleeping funny?" Whew, deep breath. I don't know the game plan - don't know what other tests they can run - and it's too soon to have an idea how long they plan to keep him. I'll send updates. First ,thank you for so much support and love. We really appreciate it. Steve rolled his eyes when I told him I emailed "a lot" of people...but he was really glad that folks know and are wishing him the best. Second, the much improved news, is that Steve is doing night and day difference better. He's out of ICU and in the general patient/cardio wing (405W). The doctors can't really pinpoint anything yet except that his 2nd of 3 cardio enzyme labs came back elevated so they're going with a cardiac problem pretty much, sort of, maybe. However, Steve was bitten by something (bee, wasp, spider?) and remembers swatting at it and starting to go back up the ladder when he realized something was very wrong. He doesn't remember walking across our back yard and up the deck and sitting down on a bench there. (He also doesn't remember the helicopter ride which really bummed him out.) He said that, when the disorientation hit, everything went gray and silent. So, many people have said it sounds like anaphylactic shock but the doctors aren't convinced. Dunno. He called a little while ago and they were taking him for an MRI. 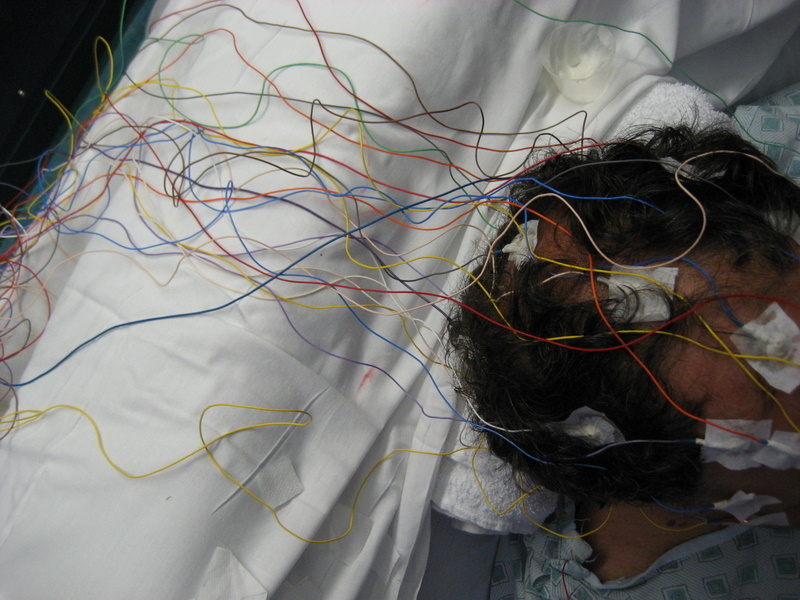 He still needs an MRA (magnetic resonance angiogram to check out the vascular situation) and and EEG. We'll see what those results yield. But, he was able to get up and go to the bathroom a couple times today and he ate a meal and his voice is much clearer. Plus, he's lucid. All in all, he's doing great. Not knowing if he'd gone w/o oxygen for awhile along with his unresponsiveness were major causes for concern yesterday. For better or worse, OK, definitely better, he's Steve again. Just exhausted and with the albatross of not definitively knowing what happened hanging around his neck. Again, we all thank you for your prayers and offers of help - especially Rebecca and her family for taking care of Paisley the last couple of days. A major Godsend knowing she was safe and happy and didn't have to be with me at the hospital seeing Daddy like that. I will be taking her for a visit tomorrow. Yay! Further good news: Steve's possibly coming home Wednesday night, at the earliest; more likely, Thursday; maybe Friday. He's awaiting a final test to be done tomorrow - the cardio catheterization. Not so much fun. A needle is inserted into the groin (local anesthetic only) which goes up the femeral artery to the heart. A dye is then injected to see how the heart is functioning. This should tell them whether or not the heart was the culprit. Right now, the doctors are pretty much leaning towards anaphalactic shock. However, If there's damage, they'll put a stent in. If not, they'll chalk it up to the critter that bit Steve. We're really hoping it's that because carrying an epi pen around seems a whole lot easier than dealing with the physical and emotional ramifications of heart damage. Steve's got his laptop and has been reading his emails and, I think, enjoying them. You know how he gets though about admitting to happiness...Thank you, again, for all the support and love you've given us! It has really helped us knowing how much, and how many, care. It's me, Steve. Still alive and kicking. I just wanted to thank all of you for your love, prayers and good wishes. I was climbing up a ladder to trim some branches from a tree. Something was irritating me on my right shoulder, I don't remember any buzzing but thought it was flying. So I swatted at it with the saw in my hand. Within seconds the world lost all it's color and got very quiet. The last thing I remember is saying to myself, "get down from the ladder." I don't remember getting down. Sue says I made it to the deck, so we know I didn't fall. It was a day later when I was awake again. Once I told my story, they turned me over and found the bite marks on my shoulder. Then the pieces of the puzzle started to fall into place, anaphylactic shock. But by then the specialists all had their theories as to what happened. And they all had to follow them through. So roving hoards of doctors (RWJ is a teaching hospital, so they travel in groups of 5) would visit and proscribe what I can only assume were the most extensive (and expensive) tests they could come up with. Thankfully all proved not to be the cause. So I didn't have a heart attack, stroke, seizure, diabetic comma, trauma from a fall, or any other long debilitating condition. 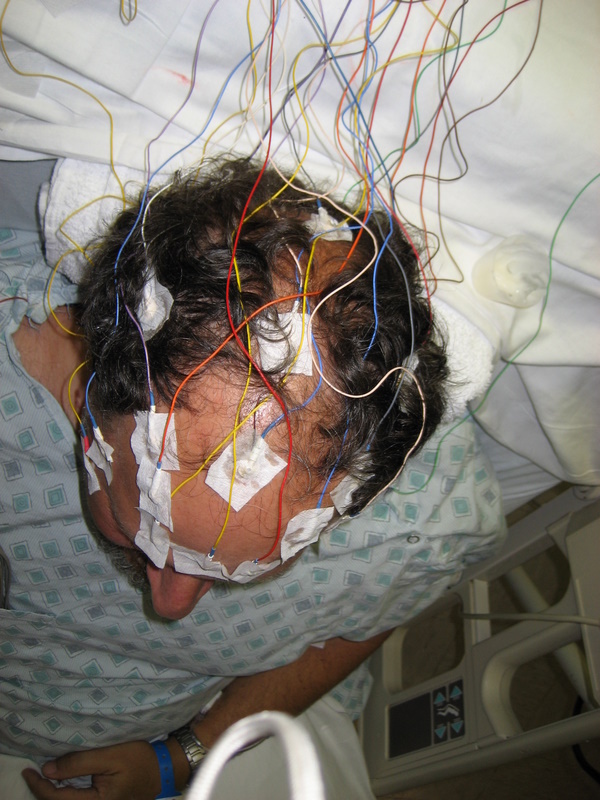 Before the bites were located, the cardiologists felt the "outward signs of anaphylaxis needed to include hives to be conclusive", the neurologists felt that there was a little extra brain activity on the EEG to rule out seizure . So I still have to follow up with a few specialties, but the head Dr is certain that this was all caused by the bug bite. "Your throat closing up and loss of consciousness are conclusive symptoms." Also the minor extra activity can be chalked up to swelling as well as test error. So tomorrow I go to the allergist to figure out what did this to me and hopefully desensitize me to it. Who knew something so small could do so much damage so quickly? I am incredibly lucky. Sue was home to find me. She says EMS was here in minutes. They flew me to RWJ and I received wonderful care. I will have an epi pen with me the rest of my life, thanks Elliot (a former PCNJ board member who invented the device). I need to have the chipped teeth repaired from when they intubated me. At least they were able to and didn't have to give me a tracheotomy. 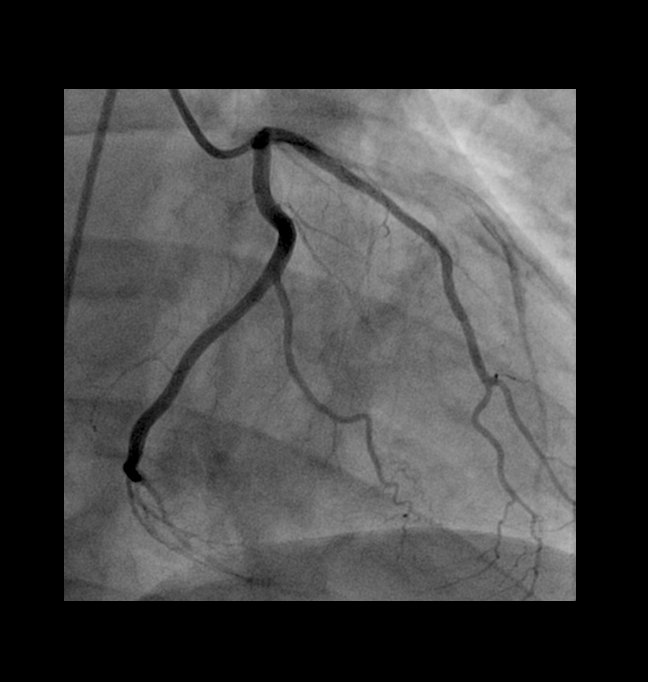 I need to follow up the cardiac catheterization (both sides of the heart), but have no heart problems. I am sore, have been poked, prodded, had my heart and lungs listened to more than a top 10 song and gave up pints of blood for testing. It could have been so much worse. I also have a loving family and tons of friends who embraced me and supported us through this.